fulfill its global LNG promise? After delays, strikes, and cost overruns, the Panama Canal expansion is finally set to open in April 2016. But the global energy landscape has changed in the eight years since construction began, with opportunities first expanding and now, potentially, contracting. The question today is whether the new canal can still fulfill a promise to transform global LNG trade. 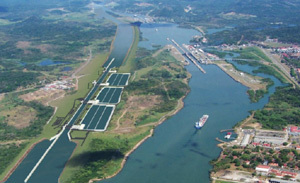 When Panamanians approved the expansion project by national referendum in 2007, planners could not have predicted the impact of the shale revolution on the production of natural gas in the United States, nor the potential for the Panama Canal to play such an important role in creating a global LNG market. By doubling the waterway's capacity, the new canal will be able accommodate over 88 percent of the world's LNG fleet, up from just 8.6 percent today. By 2014, the United States was on track to become a net exporter of natural gas. Operators along the U.S. Gulf Coast clambered to get export terminal proposals approved by the Department of Energy and the Federal Energy Regulatory Commission (FERC). By 2020, when liquefaction projects are completed, the United States will have the third largest LNG export capacity in the world, behind Qatar and Australia. The Panama Canal was now positioned to play a decisive role in shipping this excess capacity to lucrative Asian markets with a growing appetite for natural gas. In addition to demand, prices were the other major driver behind this LNG market growth. Unlike oil, natural gas markets have always been regional, with prices varying wildly as a result. The Henry Hub price in the United States has kept well below $5 per million British Thermal Units (MMBtu) since 2009. Bentek Energy expects the average price to stay at $2.68/MMBtu for 2015, rising to $2.84/MMBtu next year. Prices in Asia, by comparison, generally reflect long-term contracts indexed to the price of oil. Japan LNG prices regularly topped $16 between 2012 and 2014. The Fukishima nuclear accident in 2011 also contributed to a spike in natural gas demand - and prices. In the aftermath, Japan's power mix adjusted almost immediately. Nuclear power disappeared and natural gas-fired power jumped from 30 to 43 percent. These factors combined led experts to predict that with the expansion of the Canal facilitating U.S. LNG exports, regional markets would slowly become global as prices eventually converged. In addition to the United States, the other major regional natural gas exporter, Trinidad & Tobago, could also benefit from the new route. Even smaller producers such as Colombia took notice. Yet in October 2015, the global landscape has shifted again. U.S. shale production has finally dropped in the wake of plummeting oil prices. Natural gas prices in Asia have followed suit. 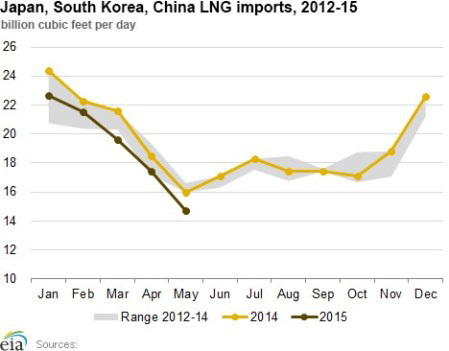 LNG imports in China, South Korea, and Japan were also down an average 6.7 percent in the first half of 2015. South Korea is leading the decline. According to the EIA , milder weather combined with government policies favoring coal-fired and nuclear power are major drivers. A drop in prices, supply, and demand should be major concerns for the Panama Canal Authority. Despite these challenges, there is still enormous potential for the Panama Canal - and for Panama's economy. The trip from the U.S. Gulf Coast to Asia is 11 days shorter via the Panama Canal, resulting in significant cost savings from fuel to personnel. A lower natural gas price in Asia will eat into profits but the market remains worthwhile. There are also regional benefits. The journey from Trinidad to Quintero, Chile will be 6.3 days shorter via the Panama Canal than the Strait of Magellan. Chile's growing economy relies on LNG imports to meet its energy needs. Panama has also set its sights on transforming global shipping in other ways. As more stringent emissions controls come into effect, the global shipping industry is making a transition from fuel oil and diesel to natural gas. Canal authorities are considering the construction of an LNG receiving terminal and bunkering facilities for transiting ships. Beyond LNG, the new Panama Canal is unlikely to have that much impact on the global oil market. The expanded canal will be able to accommodate tankers carrying 400,000 - 680,000 barrels of crude but that is much smaller than the majority of crude shipments. The only taker is likely to be Venezuela, which sends around 300,000 barrels of oil per day to China . Most petroleum is shipped on very large crude carriers (VLCC), which will exceed the draft limit of the new Canal. It is undeniable that volatility in the global oil markets will have an impact on global LNG trade and with it, the Panama Canal's fortunes. Still, global LNG markets are changing, and the Canal remains an influential player. Alexis Arthur is energy policy associate at the Institute of the Americas, a think tank on Western Hemisphere Affairs based in La Jolla, Calif. (alexis@iamericas.org). P etroleumworld does not necessarily share these views. Editor's Note: This commentary was originally published by Oil Price.com on October 8, 2015. Petroleumworld reprint this article in the interest of our readers.